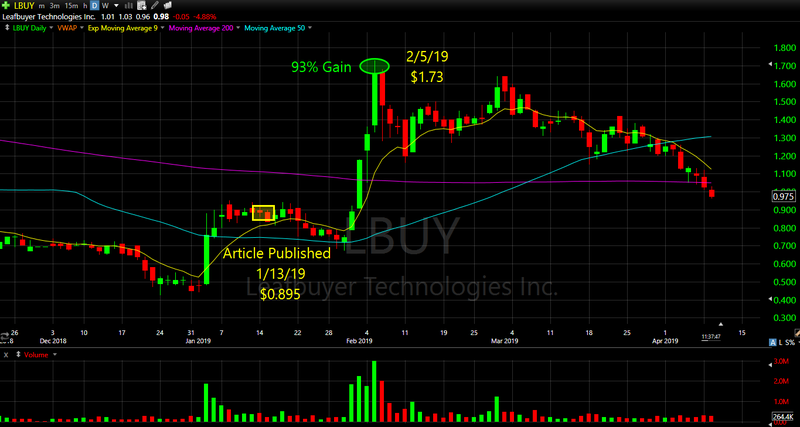 (OTC: LBUY) went on a screaming tear hitting a high of $1.73 on February 5, 2019. That marks a +93% gain in less than a month. Volatility skyrocketed as trading volume surged to its highest levels of the year. Leafbuyer Technologies, Inc. (OTC: LBUY) has been known to make some huge moves. As if +93% in under a month wasn’t impressive enough, (OTC: LBUY) actually topped that mark in 2018 gaining a remarkable +138% in just 3 weeks! It is clear that (OTC: LBUY) made a huge move following our highlight article on January 13, 2019. But this wasn’t our first look at the company. No. In fact, Leafbuyer Technologies, Inc. (OTC: LBUY) has been on our radar for quite some time. On September 7, 2018, we published an article titled, “These Marijuana Stocks Continue To Reshape The Industry.” We’ve had eyes on Leafbuyer for a while and believe we were miles ahead of the curve in recognizing the opportunity laying quiet with this company. In this article, we discussed the tremendous growth in their website traffic and how that could be an early signal of what’s to come. Their site is a valuable resource for individuals looking for where to purchase certain cannabis products and how to use them. As TheStreet.com said, Leafbuyer is becoming the “Priceline of Pot.” And we believed this company could reshape the cannabis industry as we knew it. 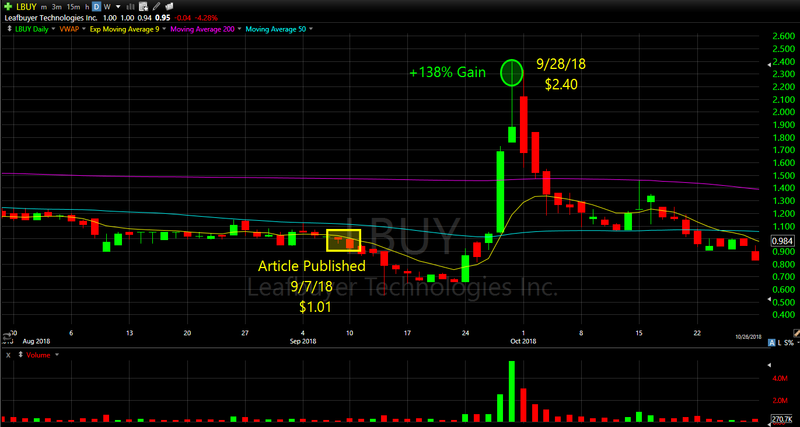 Just 3 weeks following the publication of this article, (OTC: LBUY) exploded hitting new highs of $2.40 for a +138% gain. Now you can see why we said Leafbuyer has been known to make huge moves. 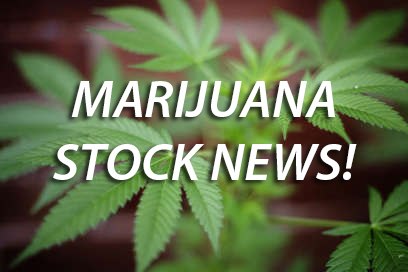 When we at MarijuanaStocks.com search for opportunity for you, we try to identify companies with disruptive technology or a cutting industry edge or advantage. Leafbuyer.com is the largest cannabis deals network in the United States with nearly 10 million users monthly. This deal website is poised to be at the center of the legal cannabis market expansion and has already saved cannabis users millions in consumer savings. Since we’re on the topic of disruptive technology, it’s key to point out that Leafbuyer (OTC: LBUY) is integrating blockchain technology into its Leafbuyer Loyalty program to create a bridge for cannabis consumers to be able to complete monetary transactions electronically with dispensaries and product companies. Consumers will be able to create their own blockchain wallet, called the Lefabuyer Wallet. Users will be able to link to local dispensaries, view their account and transaction history, and see their loyalty points. See the company press release. The cannabis industry is exploding, in case you haven’t noticed. Forbes predicts North American marijuana sales could surpass an astonishing $20 Billion by 2021. That is a yearly combined growth rate of 25%. Is 25% a lot? Put it this way, the growth rate of the dot-com era was 22%. 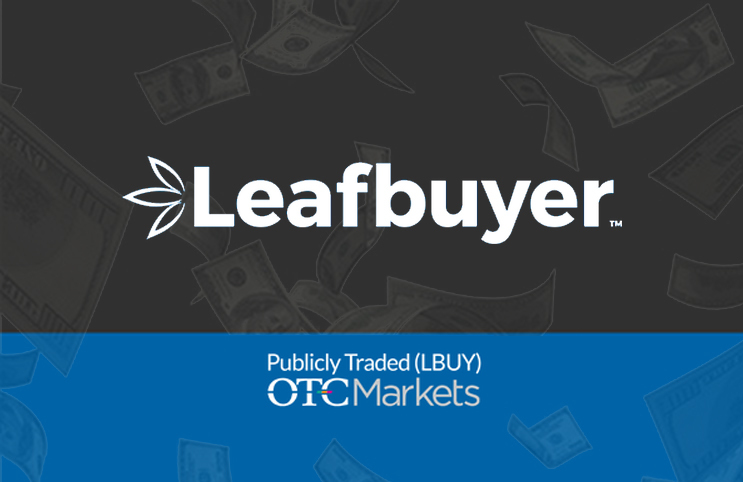 Leafbuyer (OTC: LBUY) is pushing and focusing on entries into new markets to offers local deals to more and more American cannabis users. The company recently announced it had established a solid footprint in the Oklahoma market where more than 1,000 dispensary licenses have already been issued. Such intense competition for Oklahoma dispensaries makes it important for them to utilize consumer acquisition platforms and offer deals to attract consumers. This provides a great opportunity for Leafbuyer to provide the solution. The company signed up more than 50 licensed medical dispensaries in the Oklahoma market in just 6 weeks. See the company press release. Leafbuyer (OTC: LBUY) management is doing all the things we like to see. Sometimes it’s important to recognize that you can’t do it alone. Sometimes strategic partnerships and value acquisitions are key to rapid growth and swallowing up market share. Such moves can create first-mover advantage and position a company ahead of its competitors. Lefabuyer (OTC: LBUY) acquired leading cannabis mobile app, Greenlight. Greenlight provides cannabis consumers real-time ordering and loyalty rewards through a native progressive web application that integrates with the local dispensary’s point of sale system. The acquisition more than doubles Leafbuyer’s client base in California. Now that’s what we call a strategic value acquisition as Leafbuyer has already boarded nearly 80,000 Greenlight users. See the company press release. Solidifying the right partnerships is also something Leafbuyer management seems to have nailed right on the head. 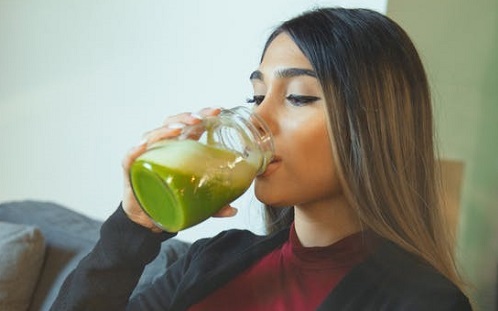 The company recently inked a deal with Flowhub, a major retail management platform for dispensaries, to integrate software and automate online menus. This could provide a value add by improving the consumer experience. Consumers will now be able to view immediate, up-to-date menu information regarding product availability in dispensaries using Flowhub API and Leafbuyer platforms. Rather than relying on a dispensary employee to update the online menu manually, the Flowhub integration will update menus and available products on the Leafbuyer.com website and Greenlight app in real time. See the company press release. And finally, most recently Leafbuyer (OTC: LBUY) announced a partnership with the Okalhoma Gazette, a trusted culture, media, and news outlet based in Oklahoma City. This new agreement will boost Leafbuyer’s visibility in the region through a digital plugin on the Oklahoma Gazette’s website. The plugin hosts live, geotargeted, cannabis-related offers from Leafbuyer’s dispensary and product company clients. See the company press release. It’s Time to Re-Focus On This Marijuana Stock. With Leafbuyer Technologies (OTC: LBUY) proving to be prone to massive moves such as the +93% and +138% runs the stock experienced in recent months, and the news flow about user growth, key market expansion, and strategic acquisitions and partnerships, it is clear that we need to focus on Leafbuyer now perhaps more than ever before. 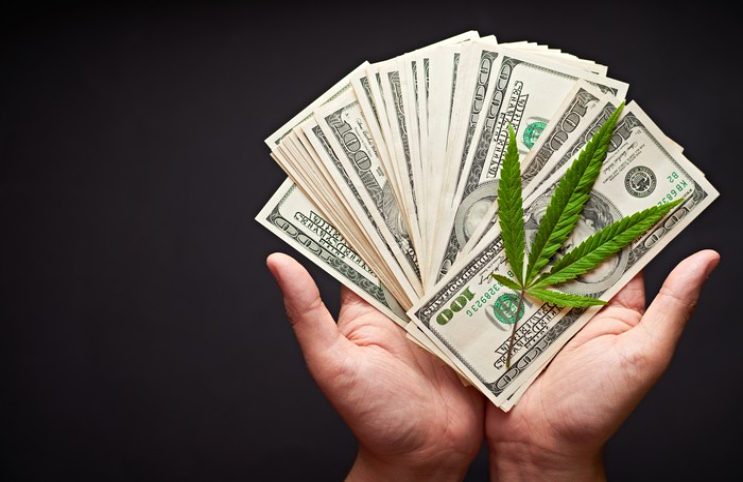 Pursuant to an agreement between an affiliate of MAPH Enterprises, LLC (owners of MarijuanaStocks.com), Midam Ventures LLC and Leafbuyer Technologies Inc., Midam has been compensated an additional $100,000 by Leafbuyer Technologies for a period of coverage from April 12, 2019 to June 12, 2019. We may buy or sell shares of (LBUY) in the open market at any time, including before, during or after the Website and Information, to provide public dissemination of favorable Information about Leafbuyer Technologies Inc. Previously Pursuant to an agreement between an affiliate of MAPH Enterprises, LLC (owners of MarijuanaStocks.com), Midam Ventures LLC and Leafbuyer Technologies Inc., Midam is being paid $50,000 for a period of 30 days beginning November 1, 2018, and ending November 30, 2018. Midam has been paid an additional $50,000 and 40,000 common restricted shares of Leafbuyer Technologies, Inc. extending the contract another 30 days ending December 31, 2018. Midam has been compensated an additional $50,000 by Leafbuyer Technologies and has extended its period of coverage to January 31, 2019. Midam has been compensated an additional $50,000 by Leafbuyer Technologies and has extended its period of coverage to March 1, 2019. Midam has been compensated an additional $50,000 by Leafbuyer Technologies and has extended its period of coverage to April 1, 2019. Please Click Here to Read Our Full Disclosure. The post Marijuana Stocks Back in Focus for 2019! appeared first on Marijuana Stocks | Cannabis Investments and News. Roots of a Budding Industry.™.